In Belgium, there are three constituent constitutional linguistic communities. Each of these communities has its own parliament, government, administration, flag, capital, and public holiday. For example, French Community Day (Fête de la Communauté française) is celebrated on September 27. The French Community of Belgium refers to Francophone Belgians residing in the Walloon Region and the Brussels-Capital Region. It makes up about 41% of the country's total population. 80% of all Francophone Belgians reside in Wallonia. 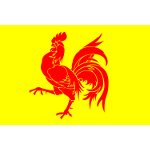 The French Community, sometimes referred to as the Wallonia-Brussels Federation, has its own parliament, government (the Cabinet), administration, and flag (the flag of Wallonia, also known as the bold rooster). French Community Day is celebrated on September 27 to commemorate an important event that occurred during the Belgian Revolution, when the royal army failed to recapture the city of Brussels from the Walloon revolutionaries. The holiday was first celebrated in 1975. On the Day of the French Community, all schools are closed, but many businesses prefer to remain open. The holiday is celebrated with concerts, theatrical performances, and sporting events.